How to compile a report using LUDS? Each municipality has an inventory of conservation plans, maps and biodiversity statistics that can be read and downloaded from the BGIS website. Below are instructions for locating the datasets and statistics for each municipality. Go to the BGIS website. 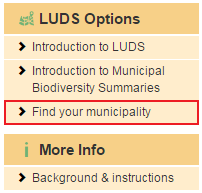 To access the The Land Use Decision Support (LUDS) section, click on “LUDS” tab. Click on “Find your municipality”. A table listing the the different provinces should open. 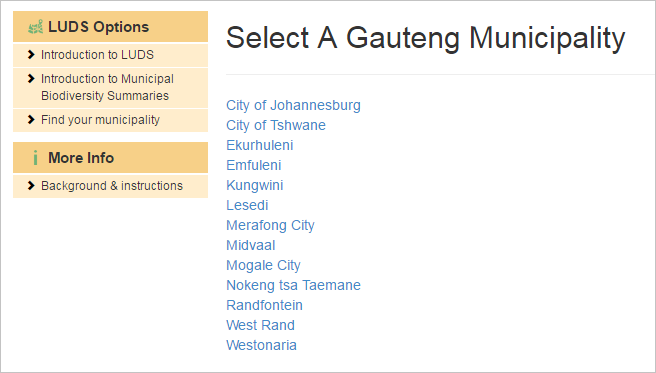 Select the province where the municipality is located. 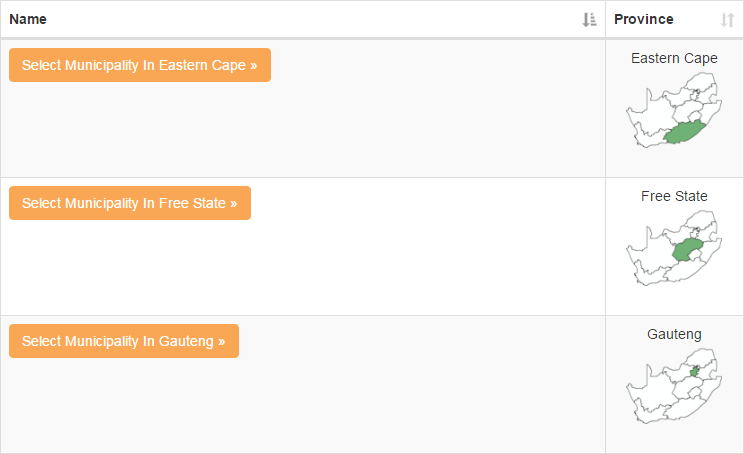 Choose from the list of available municipalities listed under the province. 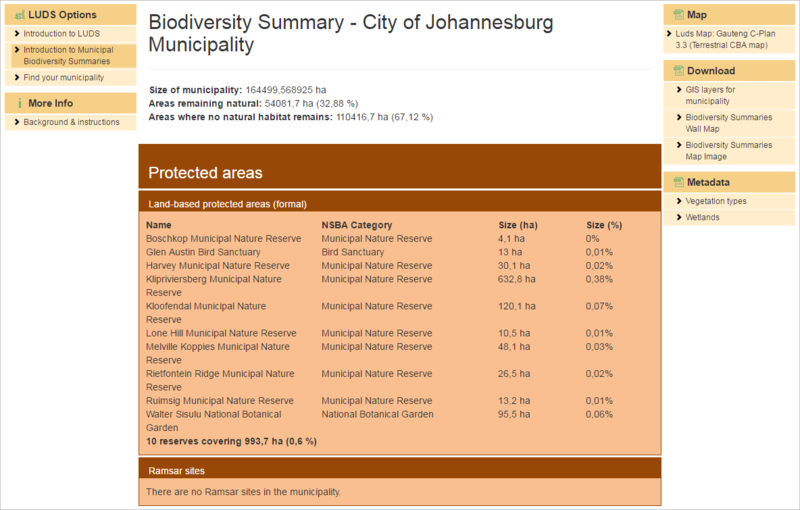 A page with biodiversity summary information of the specific municipality should open. To access the interactive LUDs tool in the interactive map viewer, click on the LUDS map link under the Map heading in the top right-hand corner. A map should open in a new window. Click on the LUDS tool button found under the LUDS tab of the Map Viewer. The LUDS step section should open on the left-hand side. Zoom in on the map to an area for your analysis at a scale where the scale bar length indicates 3km or less. The geometry of the area can be either be defined by using the rectangle tool or the polygon tool. Draw your area and select “Ok”. The area of interest should not cut municipal boundaries (purple lines) and is within the boundary (red line) of the selected map. 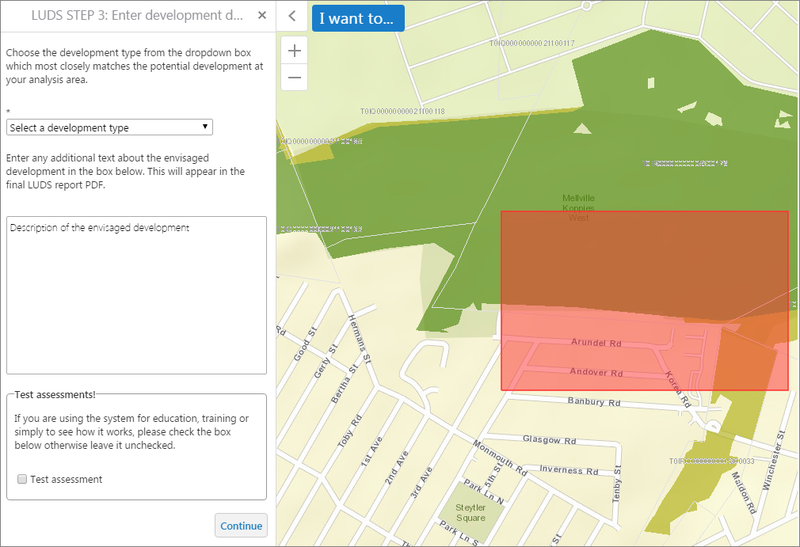 Select a development type and give a brief description of said development to appear in the report.If the LUDS tool is currently used for educational purposes, tick the test assessment option and press “Continue”. The LUDS report should then be available for download. 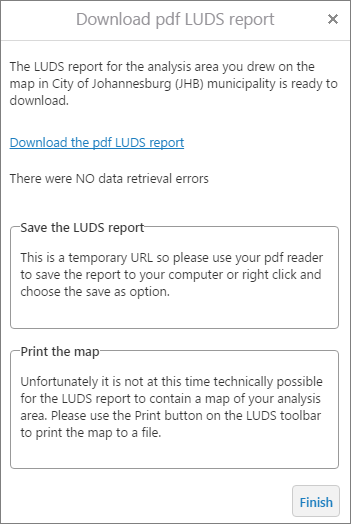 Click on the “Download the pdf LUDS report to view report in a new window . Do this before selecting “Finish”, otherwise the process will have to be repeated.